The Crystal is a high-specification, energy efficient 'intelligent' building that derives its energy from solar panels and ground source heat pumps, and uses no fossil fuels on site. It is a sustainable cities initiative by Siemens, intended as an international conference centre and knowledge hub dedicated to improving urban sustainability and promoting a low carbon future. The steel and glass structure is located in East London's Green Enterprise district. The Crystal was designed by UK architect WilkinsonEyre with structural engineeting by Arup, for Siemens plc. As well as a workplace, it houses permanent exhibition space and an education centre that are open to the public. The design was inspired by the Crystal Palace of 1851, built to house London's Great Exhibition, presenting the latest Victorian technical innovations. The new building has a footprint 45m by 88m. It sits at the west end of Royal Victoria Dock, in centre of the Green Enterprise district (set up in 2010 for low carbon businesses) that covers six East London boroughs on the north bank of the River Thames. It is composed of two steel-frame parallelogram wings clad in glass curtain walling. Each wing has a similar external geometry, with walls and roofs composed of multiple triangular planes, intended to represent facets of sustainability and the complexity of urban life. The wall planes incline inwards — from the roofline and from ground level — giving the building a 'waist'. Each roof consists of six planes, three on either side of a diagonal valley, each supported by a series of seven portals set on the opposing diagonal. The cross beams of the portals follow the roof line and cantilever at each end by up to 15m. To maximise column-free space, the internal columns have been placed along the roof ridge lines. Rectangular in section, they vary in height from 8m to 17m, and taper in different axes, top and bottom. They are wider at the top in the direction of the cross beams, and wider in the perpendicular direction at the bottom, cantilevering from their bases, providing strength top and bottom and rigidity under wind loading. Spans between columns in individual portal frames vary from 9m to 42m. All the primary steelwork, including the 28 columns and the edge and ridge beams, are box sections prefabricated from precision-cut plate. The 14 cross beams — box girders sized to match the stresses that are acting on them — were prefabricated in sections and bolted together. The largest are 72m long and were brought to site in two pieces. The frame design was optimised for minimal steel usage and speed of erection. Unusually, 85 percent of the roof connections were welded in situ, with special attention paid to the final appearance. The Crystal’s south wing houses a 270 seat auditorium, conference facilities, meeting rooms, office accommodation, a café and a restaurant. The north wing contains interactive exhibition spaces displaying information on sustainable technologies and exploring issues related modern urban living. The main entrance is on the east side, at the junction of the two wings. The all-electric building has more than 6,300 sq m of floor space, with 2,000 sq m for exhibitions. It has ground source heating and solar arrays for generating its own energy. Other measures include water conservation, façade management and electric car charging points. Energy simulation modelling was used for the selection of options. The building is founded on 160 contiguous flight auger piles 21m deep and 600mm, 750mm or 1.2m in diameter. Plastic U-pipes embedded in the reinforced concrete of the piles act as heat exchangers in the geothermal heating system. An adjacent field of 36 boreholes, each 150m deep, connected to the piles by some 17km of pipework, links to two 300kW pumps capable of simultaneous heating and cooling. The system supplies all the building's heating via underfloor pipes and around 80 percent of its cooling through ceiling-mounted beams. About 60 percent of the outgoing energy is recovered and stored in the ground until needed. The ground source heat pumps also provide heat for the domestic-scale hot water system, raising the water temperature to 45 degrees Celsius. For kitchen use (and to prevent legionella contamination) the temperature of the water is raised to 65 degrees Celsius using the energy produced by 19 sq m of roof-mounted solar thermal panels. Some two thirds — 1,580 sq m — of the roof area is covered by high-efficiency photovoltaic cells, generating 17-20 percent of the total energy demand. Battery storage is used to manage the power load to serve peak and off-peak periods. The building is also enabled for a future smart grid connection, with the capability to import or export electricity to and from the National Grid. The building is naturally ventilated using motorised automatic vents in the roof and façades. Peak or additional cooling loads are met by a 400kW air-cooled chiller. The chiller and the heat pumps are located in the energy centre. Eight 11m high air handling units are located in the triple-height exhibition hall. Three are supply and extract units with heat recovery, five are supply units coupled to roof-mounted fans. A 1m deep plenum supplies low-level air to the hall at a temperature of 20 degrees Celsius, using the principle of air displacement to condition only the occupied (lower) zone. The auditorium uses a similar system of vertical air handling units and zoned displacement air conditioning. 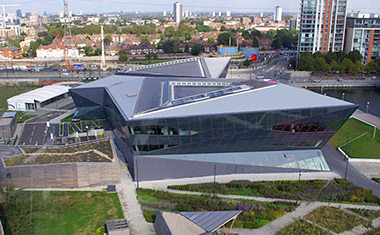 The Crystal is 90 percent self-sufficient in water supply, and it is the UK's first building to have an approved water safety plan. Rainwater is harvested from the roof via four of the corner node columns (two in each wing) through integral 200mm diameter stainless steel downpipes. The rainwater is stored in a 30,000 litre underground tank, and is treated by filtration and ultraviolet disinfection to potable (drinkable) standards. Wastewater (black water) can be diverted into London’s sewer system if required but in normal operation is recycled to a centrifugal separation plant before undergoing anoxic and aerobic biological treatment, filtration and disinfection. The treated water is piped to a non-potable tank and used on site for toilet flushing and irrigation. The way the curtain walls are designed is part of the strategy for minimising the overall heating and cooling demand. Their design solves the apparent conflict between delivering a reflective exterior effect as well as optimising for solar gain and natural lighting. To complicate matters, the British and American sustainability credit systems are rated on different parameters — overcast sky and direct sunlight, respectively. Multiple computer models were used to choose a façade configuration that made the most of the building's thermal efficiency, and passive design principles were used too. The result is curtain walling composed of six types of glass, each of different opacity or transparency, with 39 percent of the glazing as transparent panels and the remainder as highly insulated tinted panels. The panels in areas of low cooling load, such as at the café, are tilted towards the sun to absorb heat. Spaces with high heat-generating uses (such as IT loads) and greater cooling requirements, like offices, have more heavily insulated panels, inclined away from the sun to reduce solar gain. In accordance with passive design principles, thermal breaks have been used between the curtain walling and the steel frame to minimise insulation gaps. Although the building is not completely airtight, with air leakage of 2.4 cu m per hour per sq m of façade, it outperformed 2012 building regulations four fold. The Crystal also has a building management system, which includes intelligent analytics and advanced fire sensors. User detection and comfort sensors automatically adjust the heating, cooling, lighting and ventilation in order to reduce overall energy consumption. The brightness and colour of each lamp varies according to the time of day and occupancy levels. Real-time monitoring is used for fine tuning. In October 2011, The Crystal was topped out in a ceremony attended by the Mayor of London, Boris Johnson (b.1964). On 29th September 2012, the £30m centre opened to the public. It was designed to be one of the most sustainable buildings in the world and was the first to be awarded British BREEAM (Building Research Establishment Environmental Assessment Methodology) Outstanding status and an American LEED (Leadership in Energy & Environmental Design) Platinum rating. Although not designed as a zero-carbon building, it provided a blueprint for sustainable commercial development in urban areas. The use of on-site renewables reduces its carbon emissions by more than 65 percent, and its typical annual energy usage is in the region of 83KWh per sq m — about half that of comparable office buildings (2016).